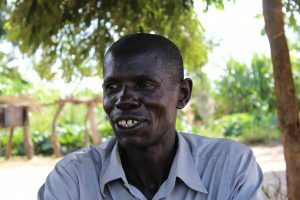 Seeking safe haven from war in South Sudan, Joseph Wani left his home in Yei and travelled to start a new life in Uganda as a refugee at Rhino Camp Refuge settlement site in 2008. 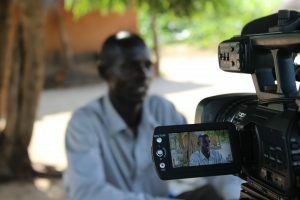 He left South Sudan with his wife and four children. She soon gave birth to two more children as they lived in the camp. Hardships, including language barriers, poor communication with the host community, difficulty in adapting to the environment and difficulty in accessing basic needs of life unlike back in his home country, he resorted to alcoholism. He ended up having health problems because of the consumption of too much alcohol and in 2013 after a medical scare and with doctor’s advice, he stopped taking alcohol. At this time, he was ready to go home. He wanted to give up his stay in Uganda as a refugee and return back to home to South Sudan because of his ailing health. Just as he planned to move back, the war started again and he was forced to remain. 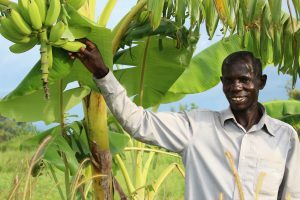 The Government of Uganda through the Prime Minister’s office started offering land to the refugees who were willing to start up lives on their own, outside of the camps. Joseph took advantage of this and was allocated two acres of land. Many refugees preferred to stay within the camps because of the handouts that they were receiving and some of those that left the camps also ended up returning back to the camps. He started growing cash crops hoping that he would sell and get some money to support his family. After harvest, he found little market for his produce and he was forced to focus on growing food crops to feed his family directly and would once in a while move to the center to go and sell some to get some money too. Last year (2016) GADC, opened up operations in the West Nile region. Based at our Rhino Camp ginnery, we started buying sesame and cotton from farmers. Joseph had planted some sesame for his own consumption but when he found out that GADC was buying sesame he sold 50kgs and earned 125,000/=. This really excited him as he had finally got market for his crops. In the New Year (2017), he hired three more acres such that he would grow cotton and sesame with the confidence of having a market for the crops. He planted sesame on two acres, cotton on two acres and used his remaining one acre to grow other crops for home consumption. He is also excited that GADC is extending a project to his area which will train them and also provide them with steady and reliable markets for their crops. His eldest son had enrolled in senior four but failed going to school after a few weeks because of no money for school fees but hopes with the intervention that GADC has brought, he will be able to provide for his family. He hopes he can provide long term security for his family, only then, he says, will he stop missing home and be satisfied in his life as a refugee.